Shooting Stars provides high quality, affordable breakfast and after school care for children attending Great Wood, Poulton-le-Sands, St Mary’s and Lancaster Road schools. 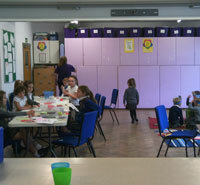 We are OFSTED registered and have 2 indoor halls as well as tarmacked and grassed outdoor areas. Our aim is provide a safe, secure, fun environment for the children where they can relax, enjoy themselves and meet new friends. We will be open 7.30am - 6pm for the Easter, May half term and summer holidays 2019 with the exception of bank holidays. Due to the closure of Christ Church, breakfast and after school care will only be available until July 2019. Shooting Stars opened in February 2009 at the request of the Headteachers from Great Wood, Poulton-le-Sands and St Mary’s schools who identified the need for the provision. It is managed by a qualified primary teacher who runs the service on a day to day basis along with a strong team of staff members to provide child centred care in a safe and secure, homely environment where children can participate in a variety of fun activities, make new friends and develop new skills. We work closely with the Headteachers to ensure the provision meets the requirements of the children and the parents.